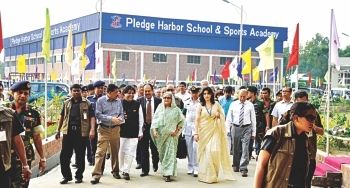 Prime Minister Sheikh Hasina inaugurated the campus of Pledge Harbor School and Sports Academy on Sunday, October 16, 2011 at Singair Dighi, Maona, Gazipur. She was accompanied by Education Minister Nurul Islam Nahid, Local Member of Parliament Al-Hajj Advocate Md Rahmat Ali, Secretaries and High Officials of the Bangladesh government. Sheikh Hasina expressed her happiness for the establishment of the largest boarding school and sports academy in the private sector for the first time in Bangladesh. The Prime Minister was impressed by the international models of classrooms and accommodation for proper education of the students. She praised the multimedia classroom facilities along with the facilities for sports. She also mentioned that the government of Bangladesh is also providing modern education facilities to all the government schools. School Chairperson ATM Saidul Alam, in his speech, mentioned that while starting the establishment of the school he was disheartened by the multinational Bank's commonly practiced policy of not investing in eduction and health service initiatives. He requested the Prime Minister to look into this and take initiatives to revise the policy. Education Minister Nurul Islam Nahid mentioned that the government is taking initiatives to modernise the whole education system.